Well, it had to happen some time soon. Every morning Deputy Dawg & I go for our walk in the back forty, camera in hand in case we get surprised by something worthy of the Wild Animals thread. This morning we were greeted by a different sort of surprise. We had a cold dry blast come down off the bay last night picking up a lot moisture and bringing us a little surprise this morning. Deputy Dawg took it all in stride, bouncing around like a fool, rolling in the snow like a goof, getting his good wool coat and hunting vest all full of snow. The tally for the day was one rabbit, one ruffed grouse and a flock of Turkey, at least 6 that I counted. Joan, where is up there? That would be my guess too. I don't think I recognize the angle of the photo though. I'm used to the "straight up the hill to Tuckermans Ravine view" from the AMC camp. Yup. 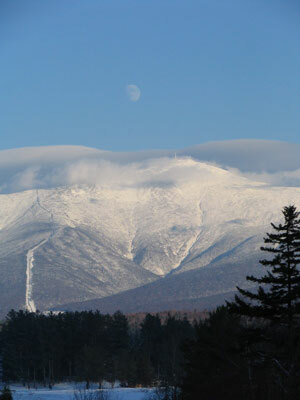 It's Mt Washington. 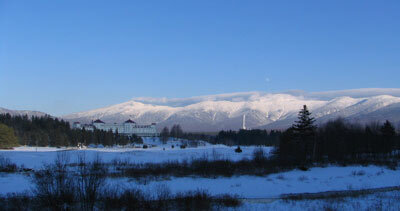 If it wasn't zoomed, you could also see the big hotel at Bretton Woods. Hey isnt that the mountain always featured on the weather channel? Oh how cool , What a view ! 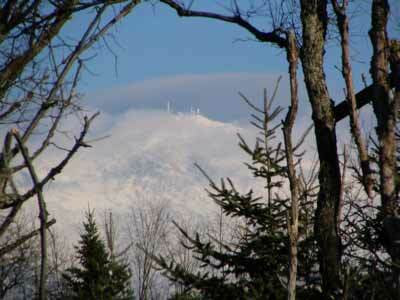 Mt Washington has the highest recorded wind on Earth ..... 231 mph. Amazingly, there is still a wooden building up there. The long open area you see going straight up from the base is the Cog Railway. They started running it in the winter for skiers in recent years. It is a major attraction in the summer and you can see the smoke from the coal fired engine, as it reaches the top of the mountain, from miles away. The pictures make me think of something from Lord of the Rings or a Hans Christian Anderson type illustration. Well, that sure beats the heck outta what I get ta see out da window. That's about 50 miles from where I live . I am just about far enough from the snow down here - but it sure looks pretty. I will be up that way in September and if the weather is good, I hope to hike the mountain - or probably another peak I haven't yet. Anyone every try a pull pal?